Lagos State Governor, Mr Akinwunmi Ambode has declared Friday, June 12 as a work-free day in commemoration of the annulment of the June 12 1993 elections. In a statement signed by the Chief Press Secretary to the Governor, Mr Habib Aruna, on Thursday, the Governor said that the date marked a watershed in the annals of transparent, free and fair elections in the country. He said June 12, 1993 was the day Nigerians voted in one voice without ethnic, racial and religious bias, saying it represented the real democracy day when Nigerians said no to voting along ethnic lines. The Governor said regrettably, 22 years after the annulment, the Nigerian nation is still grappling with some of the vices which the June 12, 1993 elections sought to confine to the dustbin of history through undue clinging to ethnic cleavages by some political gladiators. He urged Lagos residents to spend the day in sober reflection and in remembrance of the martyrs of the June 12 elections struggle for laying the foundation of the democracy which the nation is now enjoying. Similarly, in accordance with the June 12 (Declaration As M.K.O. Abiola Day) Law of Ogun State, the Ogun State Government has also declared Friday as work-free. According to a press statement by the Secretary to the State Government, Mr Taiwo Adeoluwa, the government enjoined residents of the state to spend the day to celebrate the 22nd anniversary of the annulled election peacefully. He asked for prayers for the continued repose of Chief Abiola whom he refereed to as “the martyr of democracy”, and for general political and socio-economic growth of the country. 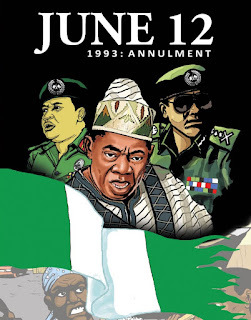 The June 12, 1993 election was presumed to have been won by late Moshood Kashimawo Abiola. Also Governor Abiola Ajimobi of Oyo State has declared June 12 as public holiday in the state. This is contained in a statement issued by Soji Eniade, the state’s Head of Service. The statement quoted the head of service as saying that "the Executive Governor of Oyo State, Senator Abiola Ajimobi, has approved Friday, June 12, 2015 be observed as public holiday in the state." He said the date was set aside to commemorate the 22nd anniversary of June 12 general election that was annulled by the then military government. He stated that Ajimobi had urged the people of Oyo State to remain steadfast in their prayers for sustainable democracy in Nigeria and development in Oyo State.